The Lodge is located on Punta Burica about 17 kilometers south of the town of Puerto Armuelles in one of the most beautiful areas of Panama. The area boasts a wealth of wildlife including howler monkeys and a wide variety of tropical birds. The main Lodge, is a spacious 3000 square feet and includes a restaurant, bar and game room with pool and card tables. There is a large covered lanai (deck) so you can choose between outdoor or indoor dining. We just had two CCA groups here with us Scott Shaheen and friends Murry, Herb and Robin from CCA San Antonio and Steve Bartholomew with Bruce, Chet and good oll Jim from CCA Austin. They weren’t slaying the fish but had good quality. 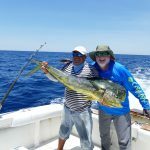 This report is covering several groups in the last 10 days all fishing 3 days. All had mixed bags of species. 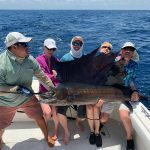 First groups John Vance and friends brought in a huge Mahi, releasing Sails and 1 Black Marlin while Ian Smith with his son and two other friends also releasing Sails, Black Marlin a huge Rooster fish, Mahi and many small Ahi.